See-Dub: I want to be a millionaire. Final answer. I want to be a millionaire. Final answer. 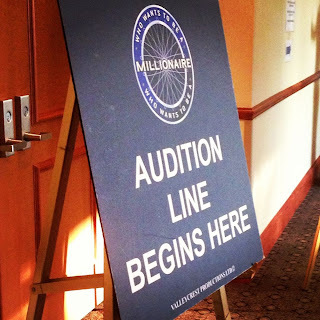 I've loved Who Wants to Be a Millionaire since its Regis Philbin days, so when the show held Dallas auditions, I couldn't resist. A trivia buff, I have always thought I could hold my own on that show, so back when the primetime version had phone tryouts, I called and called and called. Now that the program is syndicated, auditions are held in New York and "select cities." This time Dallas was one of those lucky cities, and since the tryout was in July, I was already off work. I had nothing to lose except for some sleep and a quarter tank of gas! Once the doors opened at 7, the producers let the first 200 people into a big ballroom. Alas, I was number 204. Those of us who didn't get in with that first group waited in a long hallway. After about 40 minutes, it was our turn! As everyone filed in, loud pop music filled the room. After getting all of us seated, one of the producers welcomed us and explained the audition process. Then we got our Millionaire pencils (that we got to keep!) and the audition began. We had 10 minutes to complete 30 multiple choice questions. As the show says, the questions can cover anything from Hamlet to Honey Boo Boo! Some of the questions were beyond my ken, but most of them I either knew or could figure out. One of the questions was simple multiplication but was a little tougher since we couldn't write on the test or the Scantron. When our 10 minutes were up, producers collected our tests and Scantrons and ran to an adjacent room to score them. While we waited, we could ask questions about the show and its new host, Cedric the Entertainer. There was a lot of discussion about traveling to New York if we were chosen for the show. The producers explained that if we're in the contestant pool and get the call, we would travel to New York on our own dime. We would get a list of hotels near the studio (which just moved to Harlem, BTW), and we would have about two weeks to make our travel arrangements. 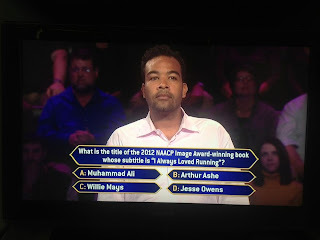 Several folks were concerned about the expense, but we were reminded that even if a contestant misses the very first question, he/she still goes home with $1,000. That would go a long way toward paying for the trip to New York! When the Scantrons were scored, a producer read a list of numbers representing contestants who "passed" the test. I never found out my score, and they never said what constituted passing, but I was thrilled to hear my number called! It seemed like about 15-20 percent of us qualified for the afternoon callback, including my tech trainer pal (but not the know-it-all lady or the two women who'd spent the night there). Those of us who passed picked up a contestant questionnaire and were told to return around 12:30 that afternoon. With several hours to kill, I found a Torchy's Tacos. While feasting on my breakfast taco, I answered the questions in the audition packet. 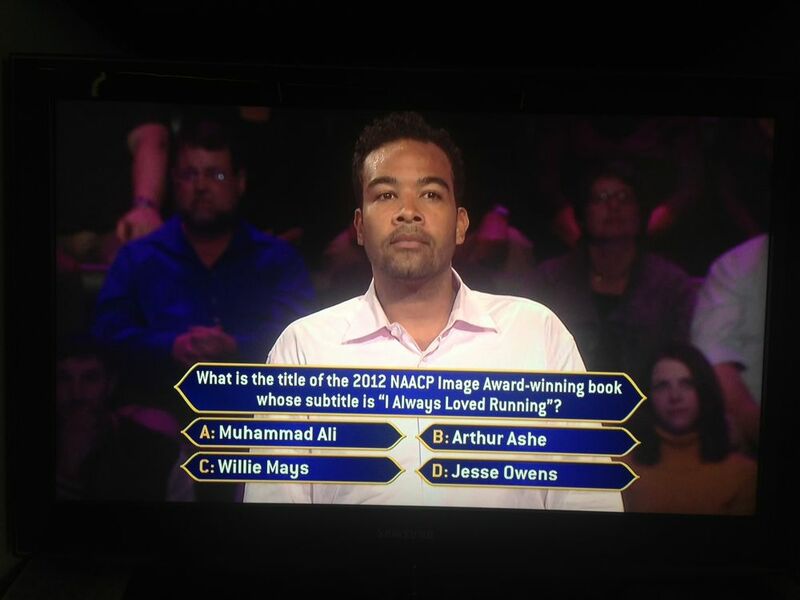 (Some of those questions were hard to answer, like what I would do with the million dollars. What I would do is boring, so I had to come up with a creative answer. Another question asked about a hidden talent. 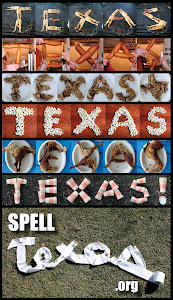 Um, I dunno: I can yell really loud when the Horns are on defense? That was tough. I tried to answer in a way that would show my eccentricity. Let's just say my football obsession and Bradymania made it into the questionnaire.) Once that was complete, I drove to Frisco to visit my beloved IKEA. After walking around a while, it was time to head back to Allen for the interview portion of the audition. This time we were ushered into a smaller room to wait for our interviews. I happened to end up sitting next to my tech trainer "friend" from the morning session. It was nice to have someone to talk to, both to pass the time and to keep from getting too nervous. Then it was my turn. I was directed to an even smaller room to talk with a producer. She glanced at my questionnaire, asked a couple of questions, took my photo, and told me, "I think you're great!" (Aw, shucks.) Then she said that from that point on, it's all luck. She said my name would now go into a lottery pool. In a few weeks, after the show reps had been to a few more cities, names would be drawn from that list to form the actual contestant pool. Once you're in the contestant pool, you wait to see if you get "the call" to go to New York and play. I must admit that the cynic in me doubted this whole "lottery pool" business. In the room where we waited for our interviews, I spotted a dozen "characters," people with interesting features or mannerisms who seemed like they belonged on a game show (much more than a middle-aged English teacher, anyway). I had to think those folks were "in" after their interviews! Still, it was nice of the producer to ACT like I still had a shot after she talked with me! In spite of my cynicism, I left feeling like I'd done all I could do. Two weeks after the tryout, I got the anticipated "maybe next time" email. Even so, I was glad I'd given Millionaire a shot. It was interesting to see the process and chat with some interesting folks, and it was flat-out fun to take—and pass!—the test. And who knows? If they come around again, I might be spending another early summer morning waiting in line.